As many of my friends, family and readers know, I made the decision somewhere along the way to bypass motherhood. A large piece of that resolution stems from a childhood and young adult years spent as the caretaker of several key people in my life: parents, maternal grandparents, younger sister and to a more brief degree, oldest niece. There is a certain amount of resentment involved in being the forced custodian of adults who really should have been looking after me and my sibling, but we all have our juvenile crosses to bear and that was one of mine. Nevertheless, having to think strategically about the safety and security of others, before I was really ready for the job, left an aversion to the responsibility that comes with shepherding a child from womb to world. There are certainly other factors that influenced the resolve: a sustained and deep-seated fear of the birthing process (that Miracle of Life video in my high school health class was no help at all), the selection of romantic partners during prime childbearing years who lacked the maturity to function as successful co-parents, and yes, I will admit it, the recognition of selfishness on a grand scale. It took me 29 years to finish my formal education, 30 to figure out what I had to do to earn my bread, 32 to actually start developing said career and nearly 34 years to find a man I could trust to do right by me and any child we might create. That’s a late start certainly, but compounding the ticking of the biological clock is a realized preference for my career and personal life over the 24/7 demands of motherhood. But I digress. Two paragraphs ago, and sprinkled throughout other written posts, are mentions of a special man with whom I entered into a committed relationship nearly 10 months ago. In March we will begin the process of looking for a new apartment – the first home we will share together. In ways too numerous to detail here, JC is the one. A lifetime pattern of self-doubt and second guessing has been completely upended by this alliance. As sure as I know the sun will keep rising, Taylor Swift can’t sing live and the U.S. Congress will leverage its inertia to run the nation into the ground, I know that my future lies with this man. How do I know? I just do. I don’t need to wonder – and that’s freaking refreshing. Of many elements from our growing love and companionship to treasure, one in particular stands out today. Planning a life with JC involves immersing myself in the worlds of the two other most important people in his existence: his 22 year-old daughter and three year-old granddaughter. That’s right. 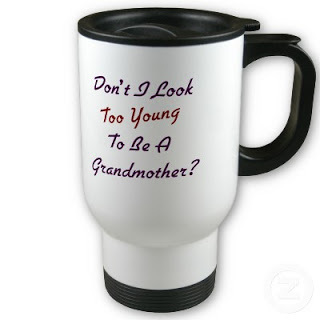 For all intents and purposes, I am a stepmother and stepgrandmother. JC’s daughter is a grown adult with a full and demanding life. She also has a mother with whom she enjoys a very close relationship. Our association thus far has been quite warm and open, and in time I hope that she’ll be able to look upon me as a trusted friend/older sister figure. Ah but the little adorable granddaughter! I met her early last summer and I am pleased to report that it was mutual love at first sight. Precocious, loving and impossibly cute, I was responding to calls of “Grandma Becka!” before the first weekend of our acquaintance was out. I might also add she came up with that moniker of her own accord. At first I reveled in the perverse delight of walking down the street, a 34 year-old white woman holding the hand of a small mixed-race darling who unironically addressed me as “Grandma.” But as the relationship grew, I found the role of granny to be rather a natural fit. I skipped right over the less glamorous aspects of parenthood (rule setter, disciplinarian, moral role model) to the fabulous privileges of grandparentdom. I never say “no” when I can possibly say “yes.” I coddle, spoil and indulge with the best of them. I think “Grandma Becka” is the role I was born to play. As JC and I plan an out-of-state road trip this weekend to visit the girls, it occurs to me that circumstances have required me to walk unconventional and circuitous routes where interpersonal relationships are concerned. I have been the parent where I should have been allowed to be the dependent. I have been the mother where I might have preferred to be the sister (through no fault of my sibling). I’ve been the divorcee where I would have much rather remained the devoted wife. But this time idiosyncratic situations have yielded wonderful results. Though I never asked for or planned it, I am now a de facto stepmother and grandmother…and I’m overjoyed.